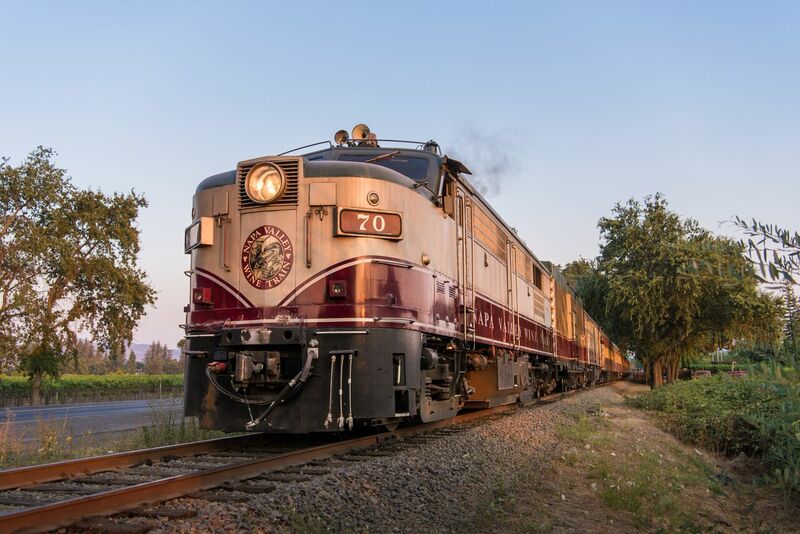 Did you know there is a Wine Train in Napa? Did you know it is family and kid friendly? 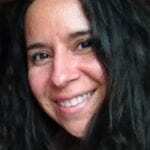 Our Bilingual Traveling Mom Taty experienced it first hand and can’t stop talking about it. 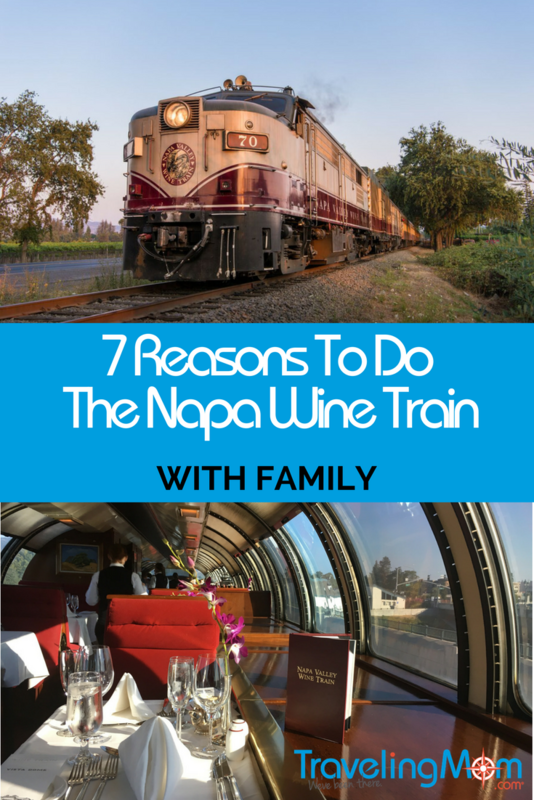 She shares 7 Reasons To Do the Napa Wine Train with Family that will have you wanting to book your train ride right away! Just over an hour drive from the Bay Area and San Francisco is Napa Valley and all its wineries. A special unique way to discover it is riding the wine train! It is a fantastic family outing that will capture your heart as you make fabulous memories with your loved ones. We did the night trip. Many people told us that we would be able to enjoy more of the landscape if we did the lunch train. They could be right, but we did see plenty and we got a spectacular sunset to top it all off! The wine train departs from the downtown Napa station. As you walk in the station you will be taken back in time into a waiting room. In this waiting room, there is a bar for snacks and drinks, a store for souvenirs and wine and a check in desk. The ride is 36 miles, and takes you through the historic town of Napa, wine valleys, St. Helena village and back. The Wine Train is a restored 10 car train that has been operating since 1989. 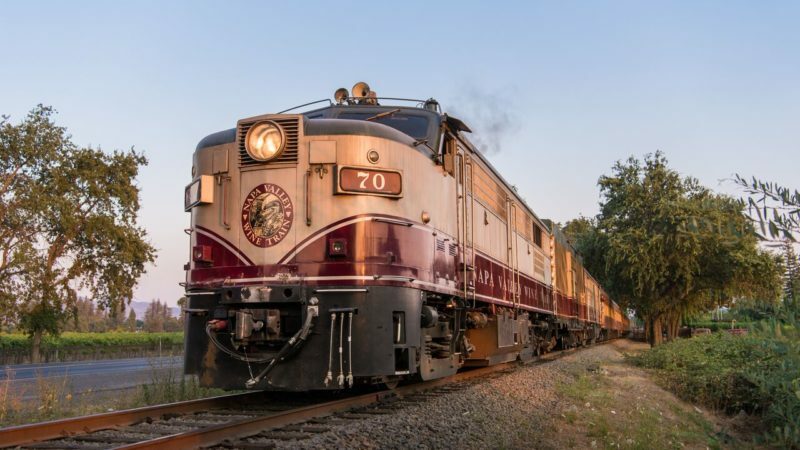 You don’t want your family to miss out on a vintage railroad travel experience that offers superb food and hard-to-find local wines for those who drink. I love when travel educates, and this train does! Traveling Mom Tip: In summer, Sundays at the Wine Train means that kids get their own special car where baby sitting is offered along with a kids menu so parents can indulge in the romance of this nostalgic train. To board the train, you walk across a lock bridge. This was the perfect moment to talk to our little ones about why people leave locks on bridges. 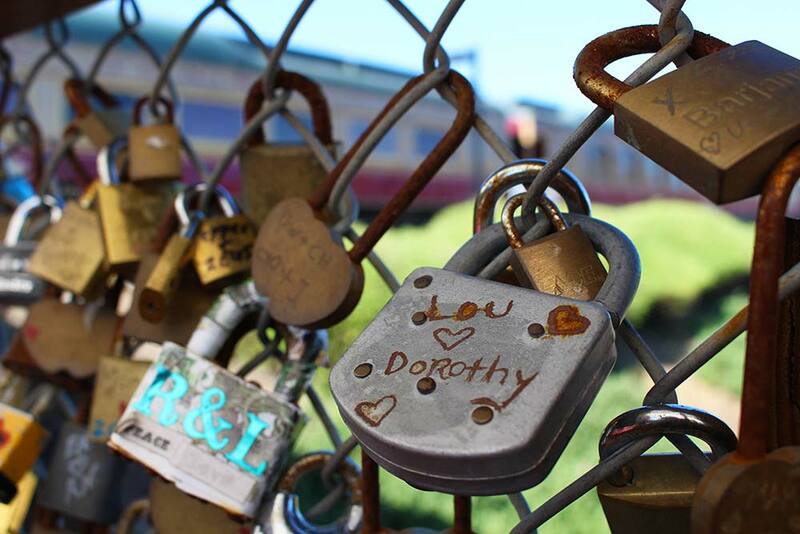 On this bridge, you can also search for the most unusual, oldest or craziest lock as you wait for a professional photographer to snap pictures of your party. 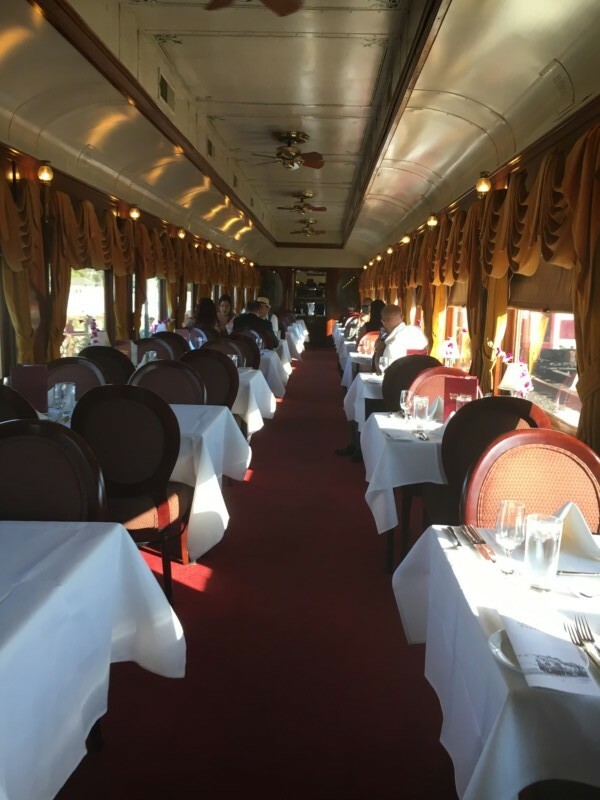 Then, depending on your ticket, you will settle in for dinner, or a just a drink if you are going to dine at one of the wineries that the Wine Train visits. History and culture are experienced via food as well. 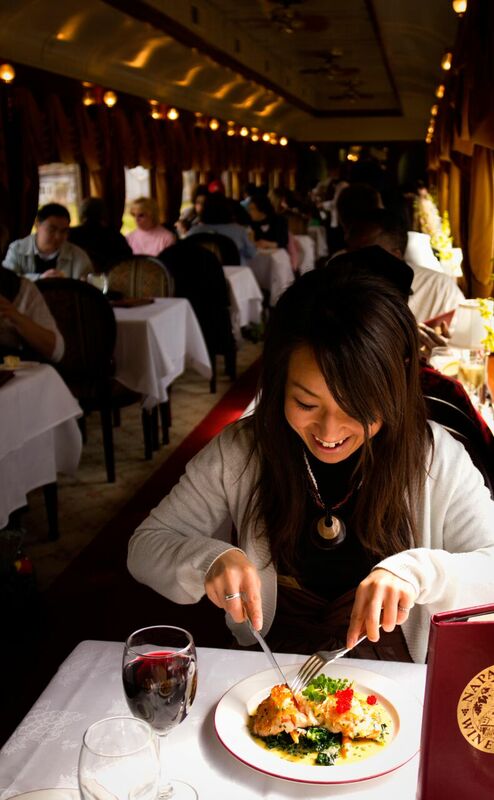 The Wine Train is a gourmet restaurant on wheels that will offer delicious meals made from fresh and sustainable ingredients. Even my son, a picky eater, enjoyed the food! He did not want to even consider choices for kids. Once on board, he was quickly enveloped in the whole experience and did not want to derail one bit. That said, the kitchen is able to accommodate; like for example, forgoing fancy sauces, to make sure your little one eats her meal. To toast along with us, our little man was offered apple cider. He is now a huge fan, thanks to the Wine Train. Shirley Temples are also an option. I encourage you to bring the kids along to give them a journey back in time for a glimpse of what travel was like in the day. The restored cars are beautiful and do vividly bring back the golden days of trains. Large windows will keep the kids looking out. We saw windmills and a scarecrow made from a series of lantern looking balls! Fun discovery for our munchkin was how small the lavatories on board are! The cars of the train come from different places. There is a Pullman (my little man impressed the maitre”D when recognized it), and a Silverado, to name two. All the cars have been refurbished to their original glam and train employees are happy to point out the differences and details of each car. In addition, because of its route, the Wine Train does not turn around. Instead, the locomotive is disconnected from what used to be the front of the train and then connected to the opposite end for the return journey. If you step out to the caboose, you can see how this happens first hand. In watching this operation, curiosity sparked and new questions pop up. In our case the biggest question was: does the locomotive have rear view cameras? The answer to that is yes according to our experienced conductor. Every person we encountered on the train was knowledgeable and available to answer our questions on the train. They were very accommodating. In particular, Miguel the maitre d of the train was gracious and patient with our little train enthusiast as he threw out facts and details that helped (interrupted) Miguel as he shared the details of the train. Traveling Mom Tip: One kid is free per paid adult ticket. A family of four will only pay for the adult tickets. Unheard savings for luxury travel! This train car books quickly and way in advance. Why is it so popular? The views are practically endless thanks to the clear dome plus the fact that this car sits higher on the train than any other car. Traveling Mom Tip: Dining here is more expensive, but if you ask the maitre d, he will accommodate a quick trip for you to see what it is all about. In all honesty, what kid wouldn’t want to ride in a fancy train? 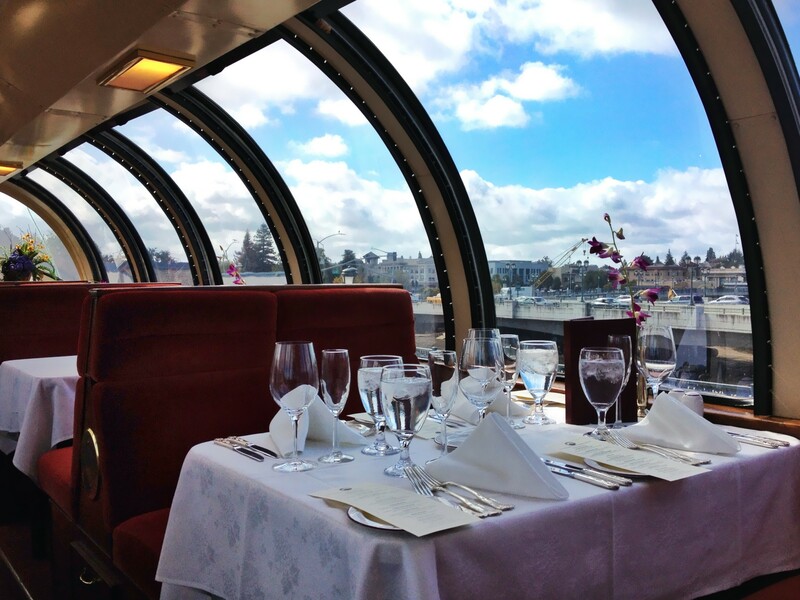 The Wine Train operates year round and it is a must do for families on Mother’s Day, Father’s Day and Christmas. Traveling Mom Tip: here are 10 more ideas on what to do in San Francisco with kids. If you are looking for more unique destinations like The Wine Train get them here.